This program scans your harddrives or CD-ROMs for audio files and reads the embeded meta information (title, artist, album, etc.) into a database. With the search capabilities of a database program you can find a title in seconds and enqueue or play it or launch your preferred audio player application, e.g. WinAmp. This software is fun when you already have collected a large number of MP3 files. It also helps to print CD-ROM labels and finds duplicate files using the FuzzyDupes engine. MP3db uses the BASS Audio Engine by Un4seen.com. BASS is well known for it's very best sound quality in audiophile circles. Then MP3db supports playback over the ASIO interface. This sends the signal directly to the soundcard, without any resampling applied by the Windows mixer. You should hear the difference. If use a professional soundcard, the ASIO drivers should already be installed on your system. Other soundcards can use the free ASIO4ALL driver to enhance the quality of sound. Wikipedia says: "an unmixed ASIO output is "bit identical" or "bit perfect"; that is, the bits sent to or received from the audio interface are identical to those of the original source, thus having higher audio fidelity." MP3db does not use any internal mixer and outputs the signal without any re-sampling. For a seamless play-back, the next title is always prefetched in another thread. The BASS engine offers additional Add-Ons for free download, that cannot be distributed with this software for patent reasons. Copy BASS_AC3.dll and BASS_AAC.dll to the MP3db program folder, to be able to playback these formats. 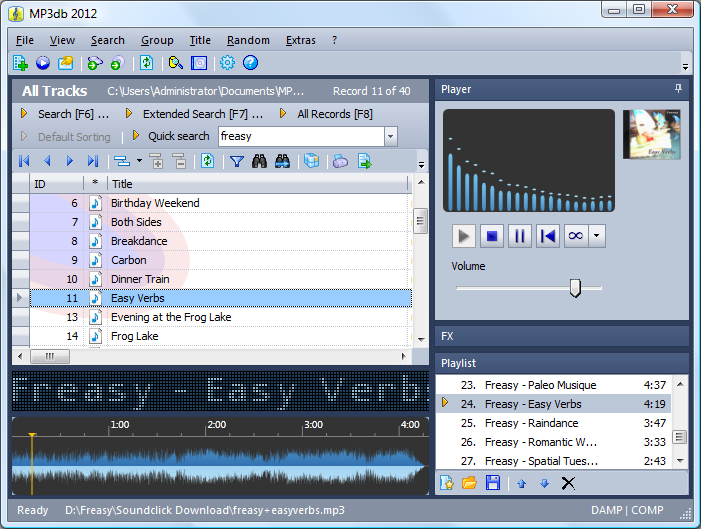 In Party-Mode (endless playback), the programm adds random titles from the database. If you choose a favorite track during party-mode playback (by double-click or enter-key), this title will be inserted at the next play position. Listen to your own music as to a radio station, or use this mode in gastronomy or with guests at home. DAMPing (Dynamic Amplifying) gently adjusts the sound to a constant level. At home with guests or when using this software in a restaurant or bar, you can create a pleasing ambiance. The database offers you functionality to organize your music clearly arranged. This is, what only a real database can offer. And you don't need to put in too much effort, because all information is already stored inside the files. This database is also designed to work with large music collections. Files from different sources can be managed within the same database. Rediscover the treasures on your hard drives, just because you can find them now. Kroll-Software assures: This software does not connect with any server and it will not transmit, what music you currently listen to, and so on. Because there ain't no such thing as a free lunch, we take a small registration fee for this program. Mixed archiving from your hard disk, network and removable media (CD-ROM, USB-Sticks, external hard drives). If you encounter problems with the database, such as playing the same file again and again, please Compact & Repair Database from the Extras menue. This download offers you a free 60-Day Trial Version. The program can be transformed into a full version through licensing. On the first startup, the options dialog is shown. Read more about the settings that needs to be configured. Please tell us write wherever it fits in this blog, what you think about MP3db. You can try out MP3db - The MP3-Database free of charge and without any obligation for 60 days. After that you will need to register if you wish to continue using the integrated player. Even without registration you can use the software free of charge, just without the player. **) This license authorizes you to use the software on all computer that you use. There are no other costs. Free updates for at least 3 years are included. MP3 files can contain copyrighted material. This software should not tempt you to violate any copyrights.